The great benefit of this lifejacket inflation system is that there is also an automatic override which usually activates within 3 seconds of the system being submerged in water. the automatic cartridge contains a powerful, retained compressed spring. 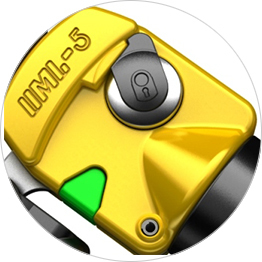 The UML MK5 Automatic Lifejacket Inflation System has a fail-safe manual pull cord, the lifejacket is inflated by simply gripping and jerking the pull toggle situtated in a handy position outside of the life jacket cover. When the paper element becomes wet, it releases the spring which pushes a plunger forward enabling a cutter pierce the CO2 gas cylinder. 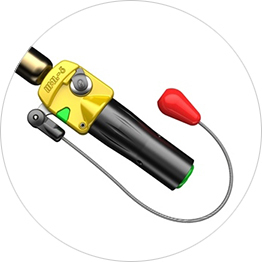 The CO2 gas from the cylinder instantly passes through the inflator head, inflating the lifejacket. The MK5 Automatic Lifejacket inflator is a robust, compact unit used in leisure and commercial activities. The unit offers both manual and automatic inflation facilities, with dual status indication confirming that the inflator has been activated. The product, approved in accordance with the ISO12402 Part 7 standard requirement for life jackets. The units are available on demand, with re-charge kits being stocked by most distributors of marine products. UML only supply to trade customers. For light use & storage; replace the cartridge at or before the REPLACE BY date. 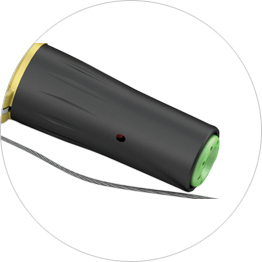 The indication on the standard MK5 Automatic inflator allows the user to establish if the system has been fired. The standard MK5 Automatic inflator does not indicate if a pierced CO2 cylinder is accidentally refitted to the inflator during the servicing procedure. The CO2 cylinder must be checked each time you don your lifejacket to ensure it is not pierced and it is tightly screwed in by hand. In addition the cartridge must be checked to ensure it has not passed the replace by date, it is also fully screwed on tightly by hand and water is not restricted from entering the system. Both indications must be green, the Automatic Cartridge must be fully fully screwed on hand tight and must be within the printed Replace By Date and a fully screwed in hand tight, full CO2 Cylinder for correct operation. The Automatic Indicator is positioned on the base of the Automatic Firing Mechanism. GREEN indicates OK, and RED indicates STOP/NOT USABLE. The Manual Indicator is positioned on the side of the firing head. These should checked each time the lifejacket is worn. If either or both of these indicators are red or missing please refer to the Re-arming tab above.